Success is rarely a random occurrence. Our thoughts—and what we visualize as possible for ourselves—are incredibly powerful. Last weekend, I attended a baby shower for my niece. The nautical-themed invitation suggested that instead of including a card with the gift, guests consider bringing a children’s book with a special message written to my niece’s soon-to-arrive son or daughter. I had somehow overlooked that part of the invitation until the night before the shower, when I was wrapping my gift. Uh-oh! There it was, the night before the shower, and it was too late to go to the bookstore or even to my local Rite Aid. At first, I was feeling stressed. But it’s funny how the universe works. Since running out to a store to buy a book wasn’t an option, I began looking through books from my 22-year-old daughter’s childhood collection to see whether I could find an appropriate (not too beat up or food stained!) book I might use. It was a lovely, nostalgic experience. I found treasures, like her copy of Where The Wild Things Are. She had written her name in the book at a time when she was just learning to write. And years later, I guess she wanted to make sure everyone knew exactly whose book it was, because she went back to the book to add her full first name—and her last name, too! Well, that book was not one I could give away. I want to keep it for her children (if it is to be.) I found myself looking into the future and imagining laughing grandchildren. Like I said, it was a nostalgic moment! The Spy Glass is a wonderful story is about a king who rules over a crumbling, neglected kingdom of dispirited people. When a traveler shows up at the king’s not-so-palatial palace, he lets the monarch look through the lens of his enchanted spy glass—a spy glass that showed the kingdom not as it was, but as it could be. The king’s imagination is ignited by what he sees. He then has his subjects look through the “magic” spyglass. They, too, become inspired to do whatever it takes to make their world look like the one the saw it could be in the spy glass. Over the years, I’ve often written about the power of visualization. In fact, “Visualizing Your Success” is one of the subheads in my new book, The New Lean for Life. Our thoughts—and what we visualize as possible for ourselves—are incredibly powerful! My friend, Jerry Holderman, knows just how important I believe visualization can be. 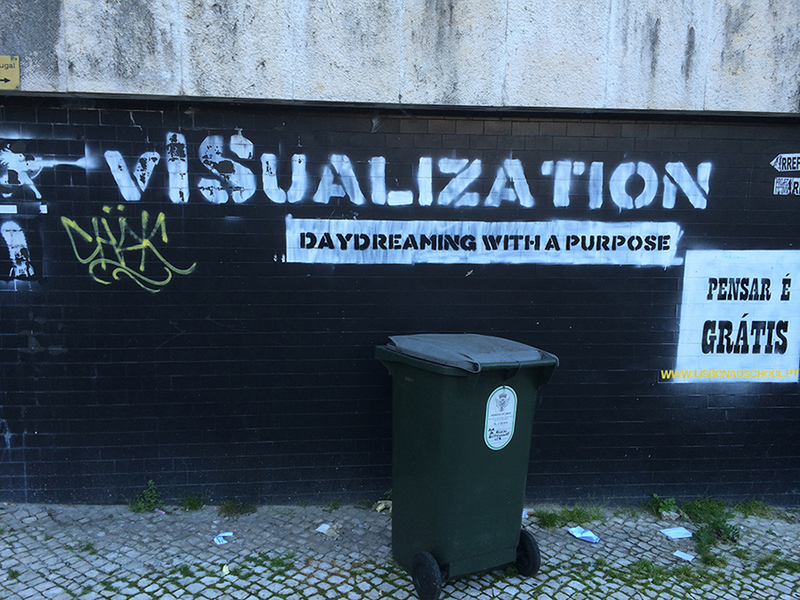 While he was on vacation last week in Portugal, he sent me a photo of some graffiti he saw on a wall near a museum in Lisbon. It read: “Visualization: Daydreaming with a Purpose.” He wrote that his vacation was everything he had visualized, and that he immediately thought of me when he saw that message on the wall. Helping people visualize and achieve healthier bodies—and lives—is what inspired me to write the book. 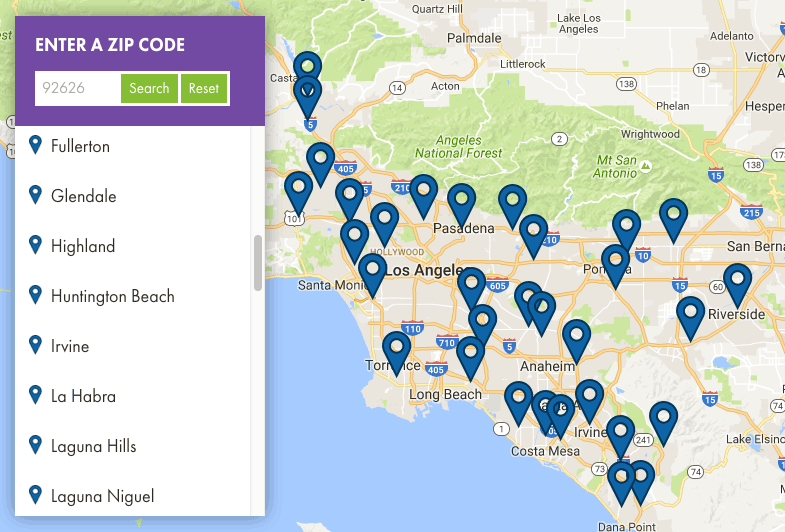 It’s also one of the reasons Lindora has been sponsoring “The Mommy Movement California Weight Loss Challenge.” I want to inspire moms to visualize, dream, imagine and achieve healthier, happier futures for themselves, their kids, and their families. I also hope being part of a group that is participating in the Mommy Movement will provide women with an opportunity to experience support—and have some fun, too! After all, when we’re having a good time while doing good things, it’s much easier to feel energized and inspired to… GO OUT AND MAKE IT SO! A version of this blog originally appeared on www.ocmomblog.com.